Soldiers from the Royal Thai Army work with members of the Mon community to repair the Mon Bridge in Sangkhla Buri. 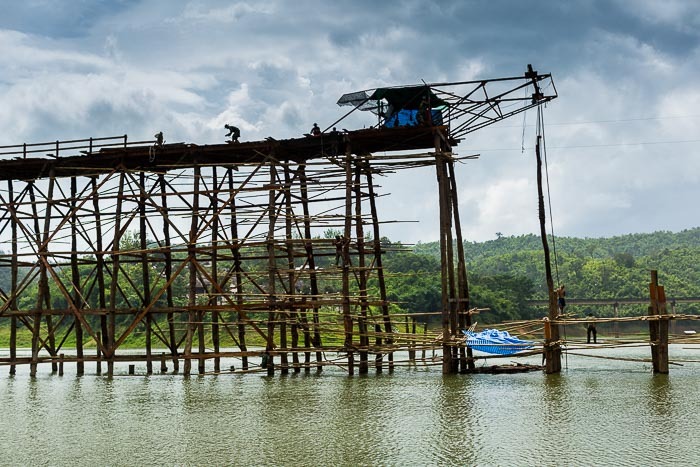 The Mon Bridge is a huge handmade wooden bridge that connects the Mon community in Sangkhla Buri to the Thai community. 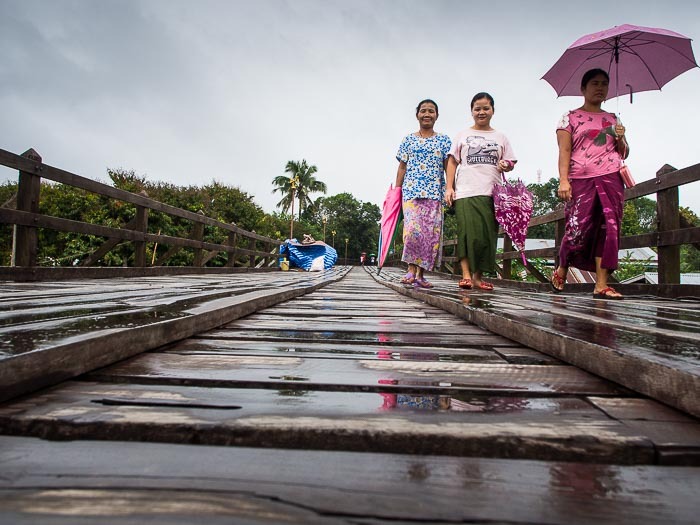 The bridge, built in the early 1990s, was the idea of Luang Por Uttama, a revered Burmese Mon Buddhist monk who led a group of Mon people out of Burma during one of Burma's many civil wars to the relative safety of Thailand. 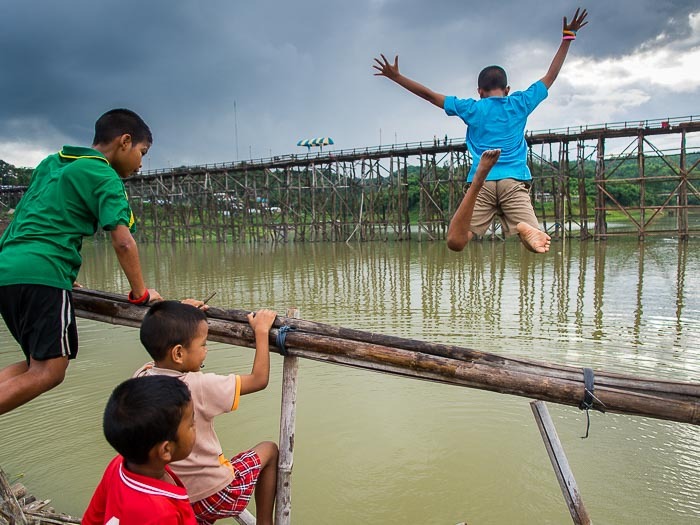 Boys jump into the Songka Lia River from a temporary bamboo bridge the Mon community built to replace their permanent bridge, which is in the background. Part of the bridge washed away in floods in 2013. The Mon community solicited donations of cash and materials from their community and set about rebuilding the bridge. Provincial politics got in the way of the repair efforts. Sangkhla Buri is in Kanchanaburi province, but in a remote corner of the province far from the provincial capital of Kanchanaburi town. Provincial politicians took over the repair and the work stalled. What was supposed to be done in months took well over a year. Most of the money was spent and there was still a gaping hole in the landmark bridge. Mon leaders appealed to the national government in Bangkok. The Prime Minister responded by ordering an engineering unit of the Royal Thai Army to Sangkhla Buri to rebuild the bridge. 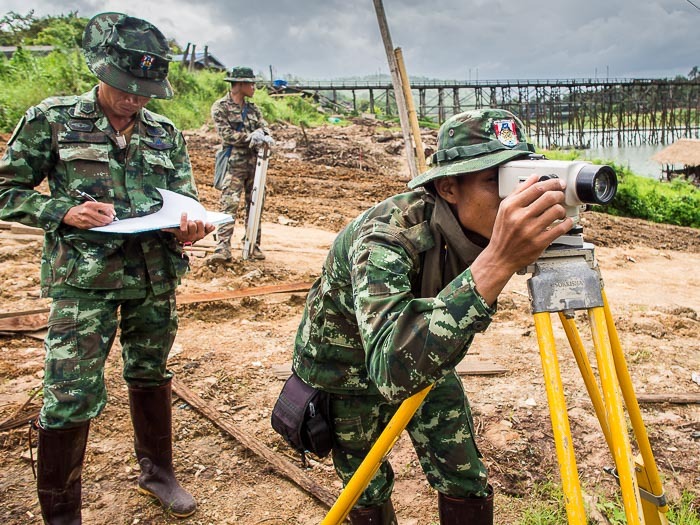 Thai army engineers survey the riverbank down river from the famous bridge, which is in the background. Thai soldiers are now working side by side with members of the Mon community to rebuild the bridge. This is old school bridge building. The original bridge was hand made. The rebuilt one will also be hand made. 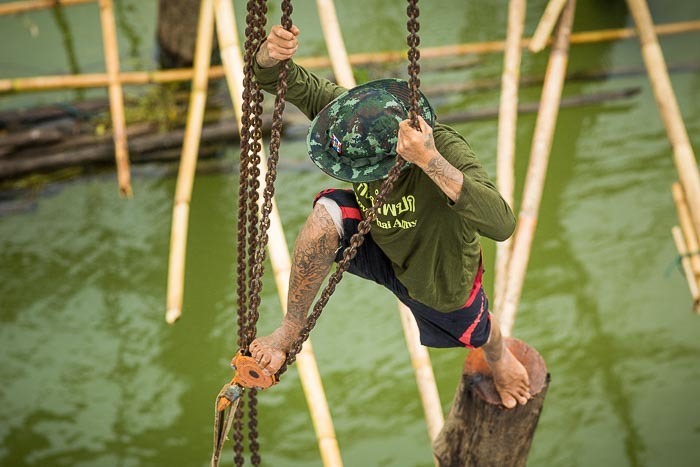 Soldiers and Mon men work side by side with hammers and nails pounding each piece of wood into place by hand. 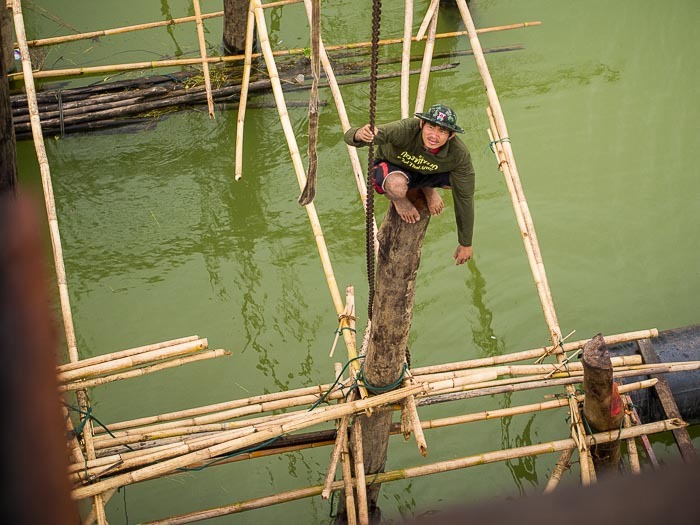 Pilings are sunk with hand pulled chains and pulleys. Some of the workers have small power saws and chain saws but they're not industrial grade saws. They're what you would find in a workshop of a hobbyist woodworker in the US. 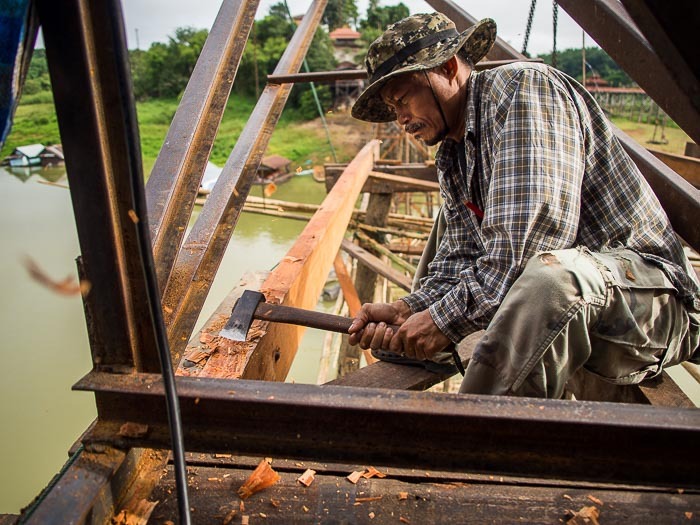 A member of the Mon community uses a small hand ax to trim a piece of lumber on the bridge deck. It's a fascinating process to watch. The first thing I noticed is that safety standards here are completely different from what they would be in the US. Most of the civilian workers were barefoot or wearing flip flops. Some of the Thai soldiers had boots, but most wore tennis shoes. Nobody was wearing hard hats. Nobody was wearing safety harnesses. There were no safety railings. Men working at water level were ducking debris thrown off the deck of the bridge by men working topside. A member of the Mon community perches on top of a piling waiting for a new piling to put into place. It's less than 12 inches (~ 300 millimeters) across. And moving onto the next piling. The local community is vested in the bridge repair. Much of the lumber being used was salvaged from the collapsed bridge. New lumber is being donated by families in the area or cut from the surrounding forests. 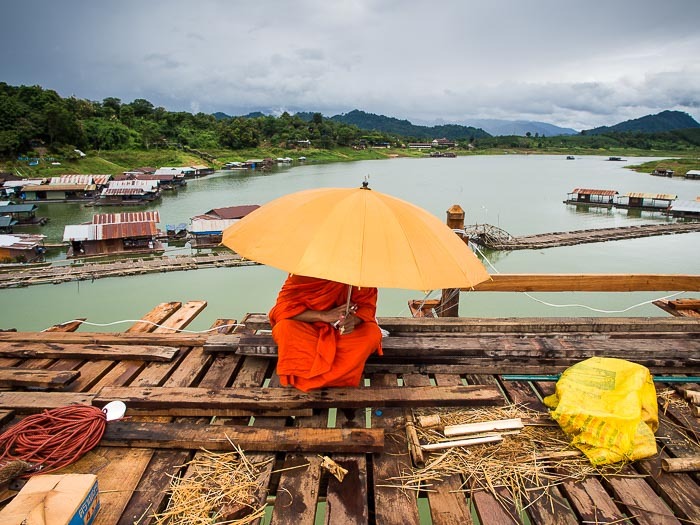 A monk from the Mon community sits on the edge of the bridge and watches the construction. Monks from Mon temples come out every day to talk to workers and watch the progress. Since this is Thailand, there's always food. Lots and lots of food. Local women prepare a daily lunch buffet for the soldiers and Mon workers. Before and after lunch, women from the community bring drinks and snacks out to the workers. One morning I was out there, work started at 8AM and they had the first coffee break at 8.30AM when a group of villagers brought coffee and sweets out to the workers. Women from the Mon community walk out to see the construction. 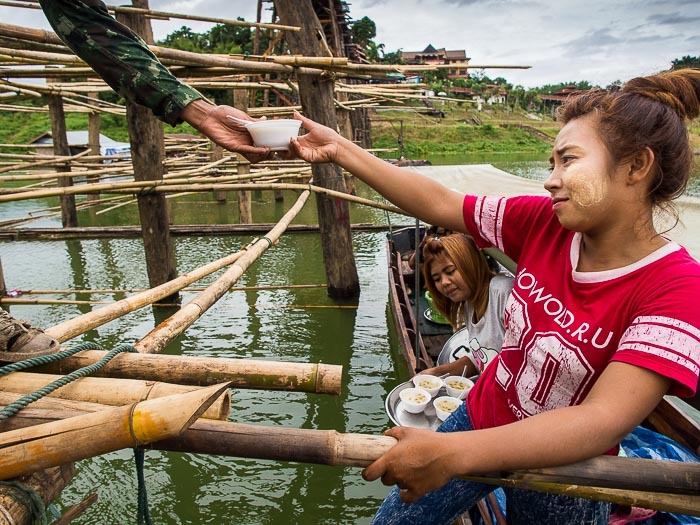 Mon women serve desserts to soldiers working at water level on the bridge. The Prime Minister has promised to have the bridge rebuilt by the end of September. That seems a bit optimistic but villagers are confident that it will be done by November, in time for the peak of the tourist season. There are more photos of the Mon Bridge reconstruction in my archive or available from ZUMA Press.